Would anyone know where I can get a Folgers coupon? 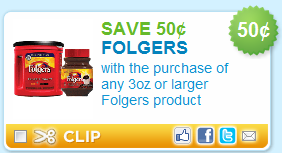 • SAVE 50¢ with the purchase of any 3oz or larger Folgers product. Found under Beverages, page one, using zip code 90210. You are allowed two prints per computer.